All welcome. The readings can be ordered from Thomas Sturm (Thomas.Sturm AT uab.cat). Hanson, N. 1962. The irrelevance of history of science to philosophy of science. Journal of Philosophy, 59, 574-586. Giere, R. 1973. History and philosophy of science: Intimate relation or marriage of convenience? British Journal for the Philosophy of Science, 24, 282–297. McMullin, E. 1976. History and philosophy of science – a marriage of convenience? In R.S. Cohen et al. (eds. ), PSA 1974, Boston Studies in the Philosophy of Science 32 (pp. 585-601). Dordrecht: Reidel. Kuhn, T. 1977. The relations between the history and the philosophy of science. In T. Kuhn, The essential tension (pp. 3–20). Chicago: Chicago UP. Burian, R. M. 1977. More than a marriage of convenience: On the inextricability of the history and philosophy of science. Philosophy of Science, 44, 1–42. Shapere, D. 1977. What can the theory of knowledge learn from the history of knowledge? The Monist, 60, 488-508. Krüger, L. 1978. Does a science need knowledge of its history? In: Krüger, L. (2005), Why does history matter to philosophy and the sciences? Ed. by T. Sturm, W. Carl & L. Daston. Berlin: De Gruyter, Ch. V.1. Krüger, L. 1982. History and philosophy of science – a marriage for the sake of reason. In L. J. Cohen, J. Łoś, H. Pfeiffer & K.-P. Podewski (Eds. ), Proceedings of the VI. International Congress for logic, methodology and philosophy of science, Hannover 1979 (pp. 108–112). Amsterdam: North-Holland. Krüger, L. 1986: Why do we study the history of philosophy? Krüger, L. (2005), Why does history matter to philosophy and the sciences? Ed. by T. Sturm, W. Carl & L. Daston. Berlin: De Gruyter, Ch. V.2. Friedman, M. 1993. Remarks on the history of science and the history of philosophy. In P. Horwich (ed. ), World changes: Thomas Kuhn and the nature of science (pp. 36-54). Cambridge/MA & London: MIT Press. Pitt, J. 2001.The dilemma of case studies: Toward a heraclitian philosophy of science. Perspectives on Science, 9, 333-382. Burian, R. 2001. The dilemma of case studies resolved: The virtues of using case studies in the history and philosophy of science. Perspectives on Science, 9, 383-404. Galison, P. 2008. Ten problems in history and philosophy of science. Isis, 99, 111-124. Schickore, J. 2011. More thoughts on HPS: Another 20 years later. Perspectives on Science, 19, 453-481. Arabatzis, T. & J. Schickore, 2012. Introduction: Ways of integrating history and philosophy of science. Perspectives on Science 20:4, 395-408. Kitcher, P. 2011. Epistemology without history is blind. Erkenntnis, 75, 505-524. Giere, R. 2011. History and philosophy of science: Thirty-five years later. In Schmaltz, T. & S. Mauskopf (eds. ), Integrating history and philosophy of science: Problems and prospects (pp. 59-66). Dordrecht: Springer. Arabatzis, T. & V. Kindi. 2008. The problem of conceptual change in the philosophy and history of science. In S. Vosniadou (ed. ), International handbook of research on conceptual change (pp. 345-373). London: Routledge. Burian, R. M. 2002. Comments on the precarious relation between history of science and philosophy of science. Perspectives on Science, 10, 398-407. Chang, H. 2011. Beyond case-studies: History as philosophy. In: S. Mauskopf and T. Schmaltz (eds. ), Integrating History and Philosophy of Science: Problems and Prospects (pp. 109-124). Dordrecht: Springer. Feigl, H. 1970. Beyond peaceful coexistence. In R. H. Stuewer (ed. ), Historical and Philosophical Perspectives of Science, Minnesota Studies in the Philosophy of Science, Vol. 5 (University of Minnesota Press), pp. 3-11. Friedman, M. 2008. HPS in a new key. Isis, 99, 125-134. Giere, R. 2011. History and philosophy of science: Thirty-five years later. In Schmaltz, T. & S. Mauskopf (eds. ), Integrating history and philosophy of science: Problems and prospects. Dordrecht: Springer. Golinski, J. 2011. Thomas Kuhn and interdisciplinary conversation: Why historians and philosophers of science stopped talking to one another. In S. Mauskopf and T. Schmaltz (eds. ), Integrating History and Philosophy of Science: Problems and Prospects (Springer), pp. 13-28. Hanson, N. R. 1962. The irrelevance of history of science to philosophy of science. The Journal of Philosophy 59:21, 574-586. Hatfield, G. (1996). The importance of the history of science for philosophy in general. Synthese, 106, 113-138. Hoyningen-Huene, P. (1993). Reconstructing scientific revolutions: Thomas S. Kuhn’s philosophy of science. Chicago: University of Chicago Press. Kuhn, T.S. (1962/2nd, rev. ed. 1970). The structure of scientific revolutions. Chicago: University of Chicago Press. Kuhn, T. S. 1977. The relations between the history and the philosophy of science. In Kuhn, The Essential Tension (University of Chicago Press), pp. 3-20. Kuhn, T. S. 1980. The halt and the blind: Philosophy and history of science. The British Journal for the Philosophy of Science, 31:2, 181-192. Krüger, L. 2005. Why does history matter to philosophy and the sciences? Ed. by T. Sturm, W. Carl & L. Daston. Berlin: De Gruyter. Lakatos, I. & Musgrave, A. (eds.) 1970. Criticism and the growth of knowledge. London: Cambridge University Press. Lakatos, I. 1974. History of science and its rational reconstructions. In Elkana, Y. (ed. ), The interaction between science and philosophy (pp. 195-241). Atlantic Highlands, NY: Humanities Press. Laudan, L. 1989. Thoughts on HPS: 20 years later. Studies in History and Philosophy of Science, 20, 9-13. Laudan, L., A. Donovan, et al. 1986. Scientific change: Philosophical models and historical research. Synthese, 69, 141-223. McMullin, E. 1970. The history and philosophy of science: A taxonomy. In R. H. Stuewer (ed. ), Historical and Philosophical Perspectives of Science, Minnesota Studies in the Philosophy of Science, Vol. 5 (University of Minnesota Press), pp. 12-67. Ruse, M. 1993. Do the history of science and the philosophy of science have anything to say to each other? PSA: Proceedings of the Biennial Meeting of the Philosophy of Science Association 1992, 467. Schickore, J. 2011. More thoughts on HPS: Another 20 years later. Perspectives on Science, 19:4, 453-481. Schindler, S. 2013. The Kuhnian mode of HPS. Synthese. Steinle, F. & R. Burian 2002. Special issue: History of science and philosophy of science. Perspectives on Science 10. Steinle, F. & R. Burian. 2002. Introduction: History of science and philosophy of science. Perspectives on Science 10:4, 391-397. Stuewer, R. H. (ed.) 1970. Historical and philosophical perspectives of science. New York: Gordon and Breach. Wartofsky, M. 1979. The relation between philosophy of science and history of science (written 1977). In M. Wartofsky, Models: Representation and the scientific understanding (pp. 119-139). Dordrecht: D. Reidel. Taller de 5 sessions, els dimarts de 18 a 20 h.
Els dimarts del 6 de novembre a l’11 de desembre de 18 a 19.30 h.
Dimecres 23 de novembre, a la Biblioteca Sagrada Familia (Barcelona) a les 19.00h. 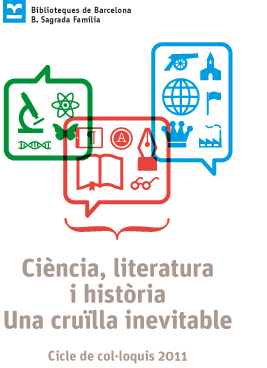 Aquest proper dimecres, dia 5 d’octubre, amb la conferència del doctor Xavier Vall (UAB) “L’evolucionisme en la literatura catalana del segle XIX” s’inicia el cicle de conferències Ciència, literatura i història, una cruïlla inevitable organitzat per la Societat Catalana d’Història de la Ciència i de la Tècnica (SCHCT) i la Biblioteca Sagrada Família (Xarxa de biblioteques públiques de la Diputació de Barcelona). Amb aquest petit cicle de col·loquis volem mostrar als lectors i públic en general, a través dels mateixos autors i especialistes, que la ciència, la literatura i la història, aparentment distants, formen una cruïlla fonamental que uneix aquests tres camps de creació en una missió de llarg abast cultural i social que cada cop es concretitza més en noves aportacions que tenen en la ficció literària una de les seves expressions més genuïnes. Tots els col·loquis tindran lloc a la Biblioteca Sagrada Família (carrer de Provença número 480 de Barcelona) a les 19h. Aquestes darreres dècades hem assistit a una eclosió de la novel·la històrica en totes les seves dimensions temporals i temàtiques. Una eclosió que ha tingut pics temàtics àlgids de gran impacte editorial. Un d’aquests punts elevats l’ha ocupat també la recreació literària del coneixement científic i filosòfic. Èxits editorials com “El Món de Sofia” de Jostein Gaarder o “La longitud” de Dava Sobel als anys noranta en són exemples. La ciència, la literatura i la història semblarien en principi separades per qüestions fonamentals com són la distància entre la ficció i la realitat i entre el passat i el present. Tanmateix, de fet formen una cruïlla fonamental que uneix aquests tres camps de creació en una missió de llarg abast cultural i social. Conscients que la nostra disciplina ha generat darrerament una producció literària que ha gaudit d’una gran requesta entre el públic lector, volem contribuir a la seva difusió i coneixement. És per aquesta raó que aquest cicle mostrarà a través dels mateixos autors i especialistes les claus d’aquest gènere literari, aprofundint en les dificultats narratives i metodològiques que la ficció històrica de la ciència comporta, així com valorant el impacte que aquesta producció literària ha comportat en el conjunt del públic lector i, en la comunitat d’historiadors de la ciència. El cicle s’estructura en tres sessions protagonitzades per dos escriptors i un acadèmic i obertes a tot tipus de públic. Aquesta fórmula permetrà combinar experiències pràctiques i teòriques per tal de proporcionar eines per a que el públic reflexioni sobre la lectura i escriptura de la literatura històrica de ficció sobre la ciència. Es tracta d’escriptors amb obra en català (original o traduïda) per tal de tenir un major impacte entre el públic català i de promoure la idea d’un format proper al club de lectura, en el que el públic assistent pugui llegir les obres presentades. Aquest cicle s’organitza en col·laboració amb la Xarxa de biblioteques de la Diputació de Barcelona que cedeix els locals on s’ubicaran físicament els col·loquis i a través de la qual es facilitarà la difusió d’aquesta iniciativa entre usuaris i públic en general. 1. “L’evolucionisme en la literatura catalana del segle XIX” . Xavier Vall. (Universitat Autònoma de Barcelona). 5 d’octubre de 2011. 2. “L’escàndol de la vivisecció en la literatura de l’Anglaterra victoriana”. Jordi Lamarca (Universitat Rovira i Virgili). 23 de novembre de 2011. 3. “Les confidències del Comte Buffon”. Martí Domínguez (Universitat de València). 13 de desembre de 2011.